JADE PLANTER TRIO by Summerfield Terrace home decor, jewelry, decor, decorations, electronics, fountains, floor mats, art glass, vases, garden essentials, fireplace screens. Lush shades of sand and jade add natural elegance to your favorite plants, showing them off to stunning effect! 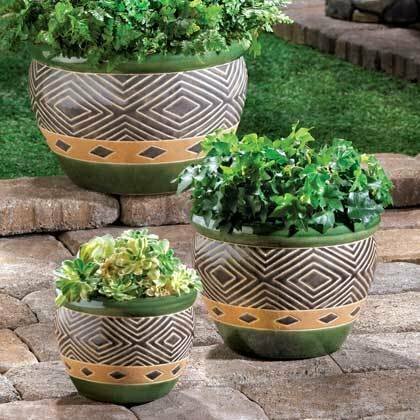 Coordinating pots in three separate sizes create an effortless designer look. Drain hole at bottom of each pot. Total Weight 13.2 lbs. Ceramic. Plants not included. Set of 3. Large: 12" diameter x 8 1/2" high; medium: 8 3/4" diameter x 6 1/2" high; small: 6 3/8" diameter x 4 3/4" high.